Relentless Financial Improvement: If it’s broken, can you fix it? Last week, our dryer no longer produced heat. It would run, spin and make noise – but just didn’t produce any heat. This dryer came with my home purchase. I always figured that the previous owner either didn’t want to keep it or maybe they forgot about it. For the last 3 years, this dryer has worked perfectly without fail. It dried my wet clothes, what more could I ask for? The wife and I went to home depot and took a look around. I was surprised by all the new fancy technology that went into dryers. They now have fancy LCD touch screens, use steam technology, eliminate bacteria, and automatically sense moisture so your clothes don’t over or under dry. This most expensive model ($1,499) we saw even could be controlled remotely on a smart phone! Do these features really dry clothes better?! Now I’m not much of a do it yourself kind of guy, so I went to Craigslist and did a search for dryer repair. I was presented with tons of ads. I noticed that most of the legit looking companies had almost the same quotes. In my area the average price seemed to be $25 service fee to come to my location, and $55 for parts and labor. I figured it was worth $25 to have a professional come over and diagnose the problem with our dryer. I called 3 companies, spoke to their representatives and looked up their information. I picked the company that sounded the most professional and knowledgable and had a handy man come to my place. He spent about 45 minutes taking our dryer apart to diagnose the problem. Turns out one of the dryer parts burnt out and needed to be replaced. 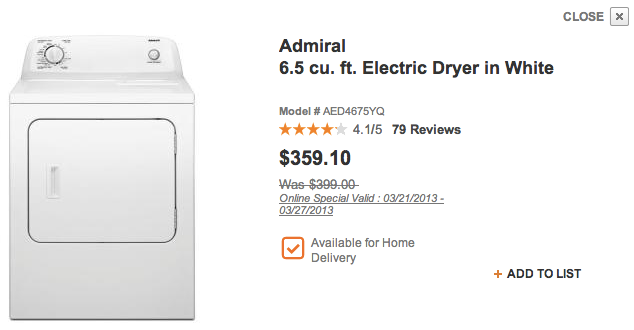 $79 later (I got a discount), our dryer was fixed with a 5 year warranty on the replacement part! The handyman even estimated that my dryer was built to last another 4-5 years. Maybe then, the fancy expensive dryers will come down in price. For now, we decided that it felt better to fix the dryer than replace it. Replacement parts for appliances are typically available for 7-10 years after they are manufactured. Newer technology likely has energy saving technology and is likely better for the environment. If the cost of a repair will cost 50% or more of what you paid for the appliance, consider getting a replacement. If you determine that your appliance is not fixable, make sure you get rid of the item properly. Consider donating your broken appliance, giving it away on Craigslist, or dropping it off at a recycling center.